Discussion in 'Science Fiction & Fantasy' started by dodge, Mar 24, 2019. Speaking of the post-credits scenes . . . very few people in my showing stuck around for the second one, and, boy, was the theater trying to drive us out before it ran. They turned up all the lights in the auditorium, the theaters employees were waiting impatiently with their brooms and dustpans, but me and a few others diehards stubbornly remained in our seats until the final bonus scene played. Leo Star Dragon 1 and RPOW0614 like this. In every theater I've ever been to that's the norm. And I don't get what the point is since it's not like they immediately start the next movie once the credits finish. Mr Tawky Tawny was the stuffed toy prize at the circus. Sitting there, UNWON for ten years. He was a magic tiger or the game was rigged. They don't frickin' do that at my theater. I always stay till the end of the credits, bonus scenes or not -- to me, the credits are part of the film -- and the lights stay off and the employees out till the studio logo comes up. They wish me a nice day on my way out, too. Your theater is the promised land. It's not just his. Every theater I've ever gone to is like that. My first job was as an usher at a movie theater. That was way back when I was in High School, the summer of 1996. It probably depends on how much direct supervision the Ushers have. It’s usually teen boys off on their own. Back than there rarely were post credits scenes or reasons for people to stay. But if we had a lot of showings ending around the same time, there was pressure from Managers to go fast. We sometimes would turn on lights right when end credits start. Other times we walk through in and look around and see it was “passable” and be done in 5 minutes. With these extended local advertising showing all the time between movies, they probably want theaters cleaned as quick as possible now. At ours, they tend to come in, but wait by the side of the partition leading towards the exit. In this case, they didn't arrive before the lights came in, but some of the people waiting for the next showing did. If you paid money to see the movie, stay until the end. Don't feel pressure from the lights or gathering of ushers. They can't do a thing about it but wait. Leo Star Dragon 1 and ichab like this. Kitty Worrier, Leo Star Dragon 1, ichab and 2 others like this. Fan made or official? Either way, it's gorgeous! Nice picture, huge damned spoiler. Such an amazing moment in the film. I heard the setup in the wizard's dialogue about the thrones, but wasn't sure if they would pay it off in this movie. When the flashback to those lines came at the climax, I involuntarily fist-pumped in the theater, because I knew where they were going, and I was stoked. Nice picture, huge damned spoiler. Well this thread is clearly marked for spoilers, so it's fairly easy to avoid. The rest of the internet... not so much. This is indeed one of those movie moments that's way more fun when you're not expecting it so I hope people do go in unspoiled, but with spoilery news titles, gifs, fanart and stuff it's virtually impossible for any movie these days to not accidentally run into something revealing about it almost immediately after the opening weekend. ^ Oh, I wasn't complaining, I know it's a spoiler thread. My thoughts were more along the line of your other comments, that I hope (probably futilely) that people might avoid seeing stuff like that elsewhere till they've seen the movie. 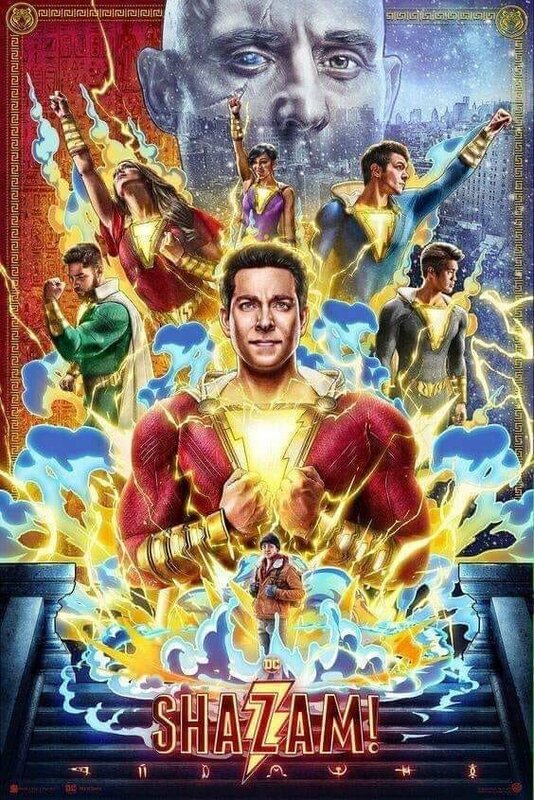 The Funko Pop twitter spoiled that part of Shazam within a few days of release, showing off all their toys of the transformed kids. It didn't bother me because I knew it would happen, but it was a weird move, especially since most people probably didn't expect spoilers from that source. At the IMAX showing of The Dark Knight that I saw, the theater staff all lined up at the bottom and stared up at me in silent protest, seemingly trying to get me to leave before the end of the credits. When I saw Days of Future Past, they turned the lights on as soon as the credits started, despite the fact that there was an after-credit scene coming that would have been virtually unwatchable with the lights on, and only relented when various people in the theater protested audibly. In one fairly recent movie ( can't recall which one ), when the film reel was finally over and I got up to leave, it was like there was no one else in the building. I was actually afraid I got locked in. I relieved myself in a dark bathroom because the lights had been turned off.